It is almost mid-way through the month of October! Where does the time go?!? Here is a special heads up for you, our faithful readers: The last two weeks of October will be special focus weeks here at The Steve Austin Book Club! We are not gonna let the cat out of the bag as to the themes we have planned, but we think you’ll enjoy them. One clue? Okay. Halloween does occur this month, doesn’t it? Yeah, those two weeks probably have something to do with that. EG put a lot of work into this week’s micro-hero… or, actually, micro-heroes! That, dear friends, is none than your hosts, EG as Batman, and OG as Robin! 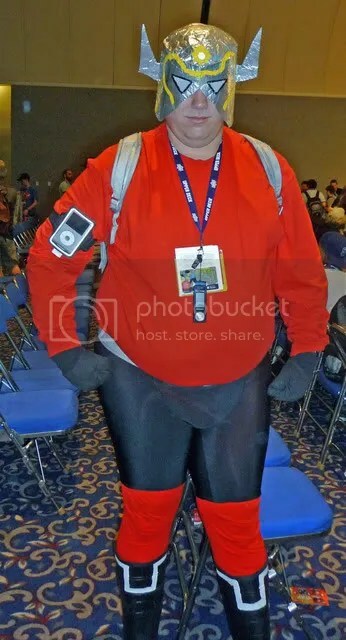 Yes, costumed for Halloween, but long has EG hassled OG to dress up for a convention, but to no avail. And, so, EG turned to the mighty art of the micro-hero to bring his dreams to life! Comic Con 2008 Day 3: Con-clusion! Here we are, returned to OG’s abode, after three great days of the Comic Con International, and a day of rest. (See? We are acknowleding that we didn’t get around to posting on Sunday, despite our assurance that we would. Sorry. We stink.) It is good to be back, and, yet, a little sad that the Con is over. We can’t complain, though. With the exception of two panels we wanted to see on the first day, we managed to get into everything we really wanted to get into. And, missing those first two panels was completely out of our control, thanks to the traffic jam we mentioned previously. We were smart with our time and scheduling, we opted for only three days of Con (avoiding excessive physical and mental exhaustion), we wisely prepared sandwiches, snacks and beverages for each day ahead of time, and we simply could not have done better. We nailed it. We mastered the Con. So, what of Saturday at the Con? EG started out the day at the Spirituality in Comics panel while OG entered the floor in a valiant attempt to procure souvenirs for his family. The panel was lively and interesting, discussing the increased number of spiritual themes in modern comics. It was a smaller panel, but it allowed a more intimate level of discussion. After meeting back up, the next program was a favorite of ours – Quick Draw! The Quick Draw panel is always fun. Sergio Aragones (of Groo and Mad Magazine fame), Scott Shaw (artist of Bongo Comics, Hanna Barbera, and much more), and Mike Peters (creator of Mother Goose and Grimm) “compete” against one another in drawing tasks (like, “The Incredible Hulk as the President of the United States”), all for the entertainment of the viewing crowd. It is an amazing display of creativity and talent to watch these cartoonists quickly draw some of the funniest things you’ll ever see. Sergio Aragones is always the highlight of this panel, and this year was no different. Just a great way to spend an hour or so at the Con. We then made our way to the DC: A Guide to Your Universe panel. The best thing about this panel? Actual announcements! That’s right – not merely dodging questions, but announcing big news. EG was thrilled to hear that DC would be bringing the Archie super heroes (you might know them as The Mighty Crusaders) into current continuity, since he still has some of those action figures from his childhood. Another great announcement was that the Milestone characters would be returning to the DCU proper. Milestone was a far-too-short-lived imprint with DC comics in the early 90’s. Perhaps the most successful aspect of the line was Static, which actually became a cartoon called Static Shock. We also learned that in an upcoming arc in the Superman books, the people of Kandor decide to make Earth their New Krypton, and that something called “The Battle for the Cowl” will be taking place in the Batman books following Batman: R.I.P. Oh, and it seems that every hero that has ever died is up for grabs for the Black Lanterns in the upcoming “Darkest Night” storyline in the Green Lantern books. Following that panel, we stayed in the same room for the Grant Morrison and Gerard Way: Born Under a Black Sun panel. This crowd was different from the others throughout the day. How so? Why, it seemed to have a much higher quotient of teenage girls in it. Seems that Gerard Way, creator of The Umbrella Academy comic is also Gerard Way of the group My Chemical Romance. (By the way – OG knew this, but EG did not. Yet another example of how modern society has just passed EG by.) The description of the panel claimed it would change our lives. As for the show itself, it was amazing. We really hadn’t realized how much we missed MST3K, and having piles of new material was amazing. It was just great to laugh until it hurt. And, then… it was finished. We made our way to the Steve Austin-mobile and headed out, tired but completely satisfied with a great Con experience. There you have it, folks. Now, on to what most of you probably really stopped here for – the pics! 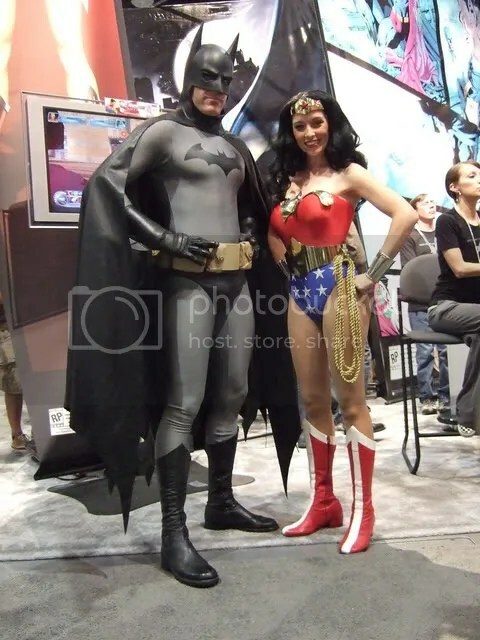 The official Batman and Wonder Woman of the DC Booth. You see that Batman costume? 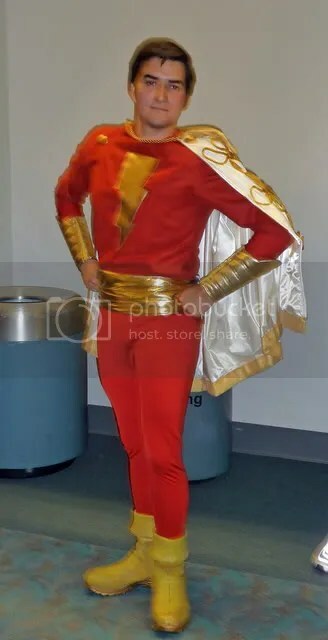 Tell me why they can't try a costume like that in the movies! It looks great! Oh, yeah, sure, it offers zero protection against... well, anything, but... c'mon! 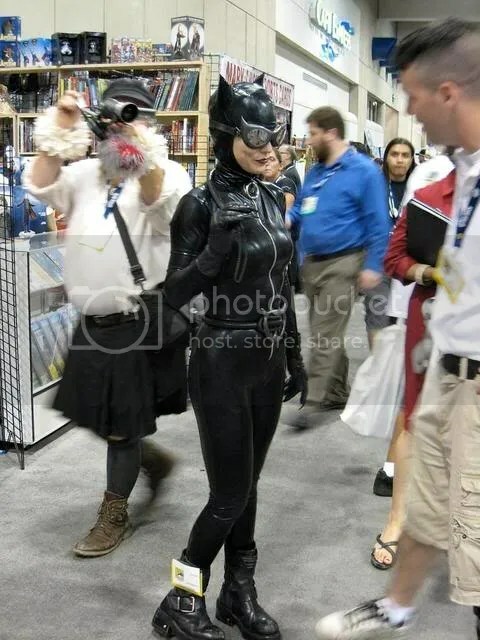 Okay, yeah, sure, there is a woman dressed like Catwoman in this picture, but we really want you all to notice the guy in the kilt behind her. Outside of Scotland, you'll not find more kilts than you do at the Con. Know what, guys? Never gonna happen. We don't care how comfortable you claim these to be, it will never be widely accepted in modern America for a man to walk around in a skirt. 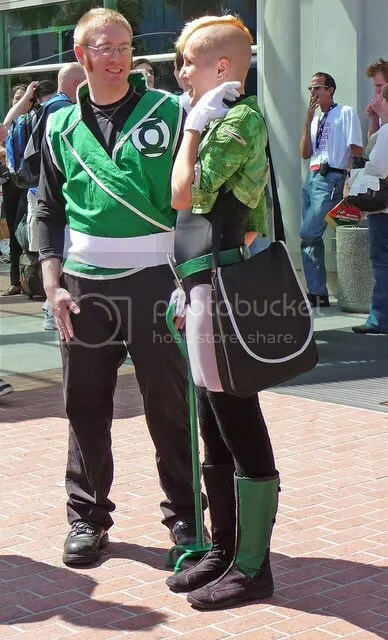 Uh... you think she just did that to her head for the sake of the costume? You know what? 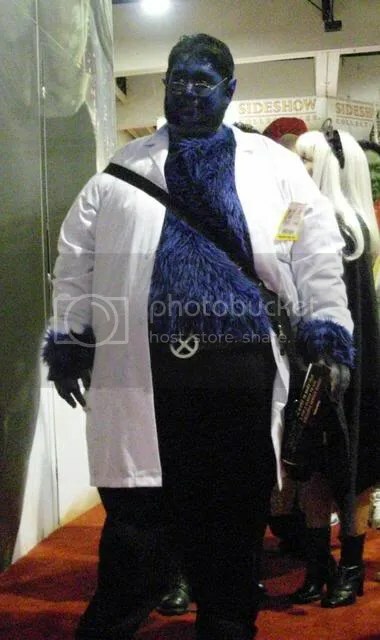 This costume was just amazingly great, so we wanted everyone to see it. Little Orphan Annie is Arrowhead Girl! 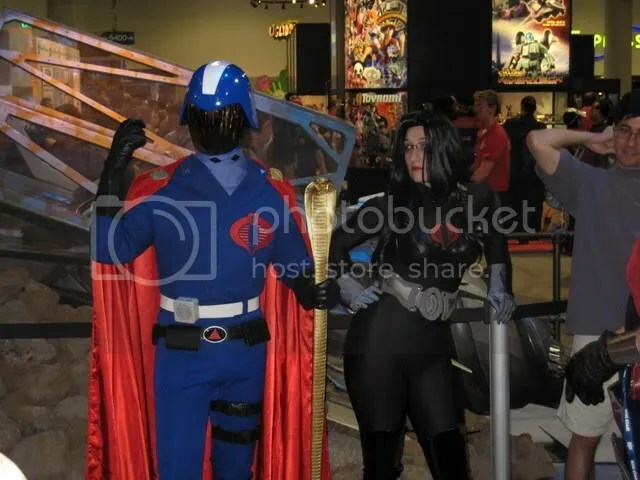 Cobra Commander performing a scene from Hamlet, while the Baroness looks on in boredom. 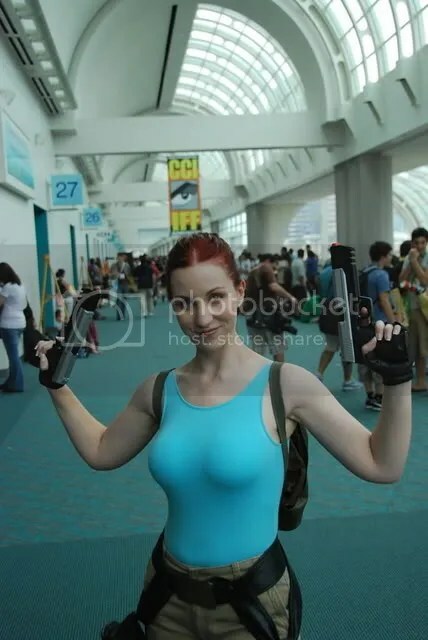 "Yep, killed me three groping fanboys so far. It's like shooting fish in a barrel here." 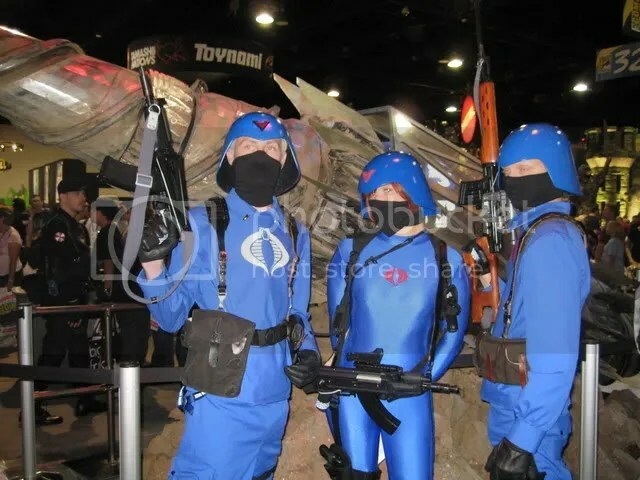 While the male members of Cobra are issued standard uniforms, the females are issued spandex uniforms. Why? Because that's the way Cobra Commander wants it. "... and she stared off into the distance, contemplating why a chicken sandwich should cost $8.00 at the Con." C is for cookie, that's good enough for me, C is for cookie, that's good enough for me, C is for cookie, that's good enough for me, Cookie, Cookie, Cookie starts with C! Tin foil Orion helmet? $2.79. Spandex pants? $17.99. Ipod for a Motherbox? $249.99. Being called Forbush Man all day long? Priceless. 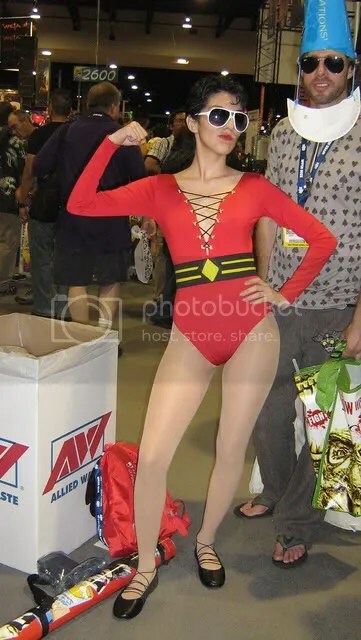 Plastic Man decides to creep out the rest of the Justice League by showing them his idea of "gender bending." "The streets are extended gutters, and the gutters are full of blood and when the drains finally scab over, all the vermin will drown. Did you know I have my very own 6" action figure, perfectly in scale to most of your children's action figures?"